Edward Hicks (1780–1849) was an American Quaker preacher during the post-revolutionary era in the United States. Taking up the painter’s brush to supplement his meagre income, he is primarily remembered as the beloved painter of The Peaceable Kingdom. Over the span of his life Hicks produced around sixty versions, each of which relies on Chapter 11 of the prophet Isaiah for inspiration. In our version from about 1832 Hicks writes the Bible reference directly into the painting directly below the left paw of the centrally placed leopard. Here is the full text from Isaiah 11:6-8: ‘The wolf shall dwell with the lamb, and the leopard shall lie down with the young goat; and the calf and the young lion and the fattened calf together; and a little child shall lead them. And the cow and the bear shall graze; their young shall lie down together; and the lion shall eat straw like the ox. The child shall play on the hole of the cobra, and the weaned child shall put his hand on the adder’s den.’ (English Standard Version). We see in the painting many of these details. There are numerous animals, a mix of wild and domestic, predator and prey: lion, leopard, wolf, ox and lamb. All seem to coexist under the care of the central figure, a young person dressed in a white robe tied with a stunning vermillion sash. Surely to be identified as the ‘little child’ of the prophecy, this enigmatic figure holds calmly onto the mane of the lion standing beside him. Across a cleft in the landscape we see two young people, one very young and tethered by the older, each with hands held directly over holes of underground dens. Isaiah’s beautiful prophecy portrays two great and intertwined hopes for the world, providing our artist with inexhaustible substance for personal and religious meditation. One great hope resides in the advent of the Child. In Chapter 11:1 Isaiah describes him as a shoot from the stump of Jesse. He’ll be the ‘righteous branch’, the Messiah King promised to David’s line. Notice that the stately Child in our painting stands before a stump and holds in his right hand the emblem of a branch. Earlier versions of the painting were unashamedly entitled ‘The Kingdom of the Branch’. Here we find the second related hope of the prophecy: the advent of a future Kingdom where shalom is restored in the world, nature is freed from enmities and all live in grace under the rule of the Child. In his Peaceable Kingdom paintings the artist makes these two hopes personal and present, often placing the scene from Isaiah into a local landscape. Earlier paintings show Edward Hicks’ optimism about life in Pennsylvania, established in 1681 as a haven for Quakers by William Penn. In the background one might see a ship arriving or William Penn negotiating a peace treaty with the Indians. 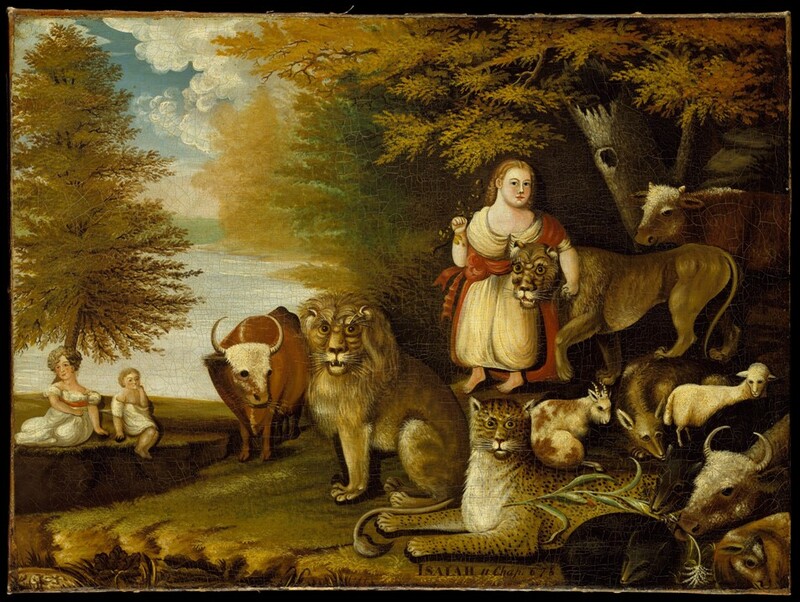 These paintings suggest a down-to-earth present-day ‘Peaceable Kingdom’. Our painting is different. The landscape is still local but historical events do not figure. And there are unsettling enigmas. Our eye is drawn inexorably to the ragged stump by a prominent knot-hole and the baby plays unnervingly close to the rift. Above all we notice the three predatory cats, their eyes like lanterns, larger than life-size, fixing us with their penetrating gaze. Unlike the black-eyed farm animals the cats stand to challenge us. They do not eat the corn lying on the ground; their thinking is elsewhere engaged. Is the Peaceable Kingdom really here and now? It is evident that Edward Hicks wishes us to consider this question deeply. Our Quaker preacher was keenly aware of the persistence – in Christian society – of sin, sometimes likening it to lions, leopards and wolves. Standing before this painting we are meant to wonder about ourselves, about the condition of our hearts and about what predatory beasts we allow to roam there. Edward Hicks, The Peaceable Kingdom, ca. 1830-1832, Metropolitan Museum of Art, N.Y., oil on canvas, 45 x 60 cm. Edward Hicks (1780-1849) was an American folk painter and distinguished minister of the Society of Friends. After young Edward's mother died when he was eighteen months old, Matron Elizabeth Twining – a close friend of his mother's – raised him as one of her own at their farm. She also taught him the Quaker beliefs which had a great impact on the rest of his life. Because he didn't do well in school, it was decided he should work for a coach maker and it was here painting signs and coaches that he learned skills which prepared him to become a painter. He married and he and his wife Sarah had four children. At one time he became very ill and as a result he began to think more seriously about his life. He started attending the Quaker church, which stresses peace and brotherly love, and eventually he became a popular Quaker preacher. As a self-taught artist Edward Hicks often painted for his own pleasure and for people in his area. On the very night that he died, at the age of 69, he was painting a Peaceable Kingdom for his daughter. Irena Tippett has a Master's degree in Art History from the University of Toronto, but it was during studies at Regent College that she discovered more recently the beauty of her field in relation to her faith. While most of her energy is presently spent in women's ministry at St. John's Anglican Church in Vancouver, she continues to lecture from time to time out of this new found passion.